Like I said in the previous post, while I am going to work on growing the line of designs and templates for Miller's Lab, the EW Couture Collection store will see its share of new products as well, this coming year. To start with, last month I added a 2010 Christmas Card Collection. 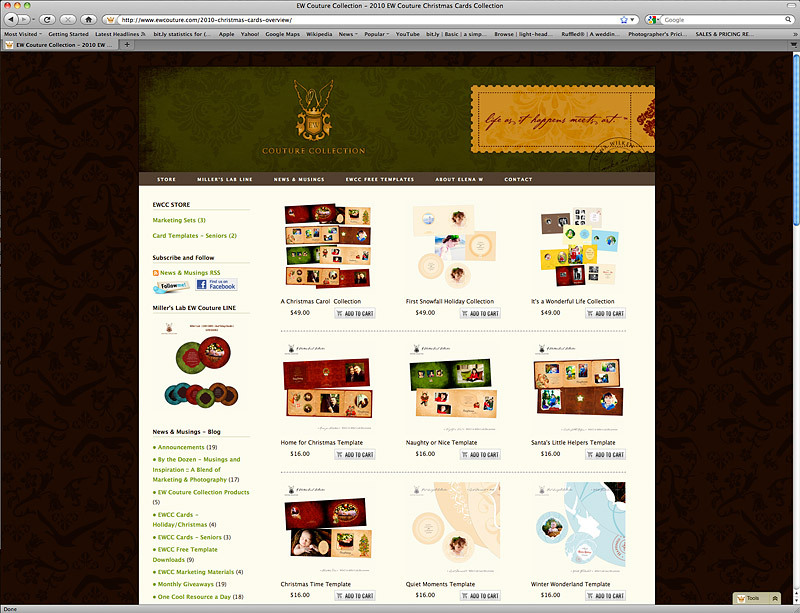 There is a lot of variety in the designs of the tastefully done card layouts. I am really excited to be able to offer them as psd files compatible with both PSE and Photoshop CS and up. Also, each one of the card designs includes files for both WHCC and Miller's Lab. The Miller's files for the Luxe cards can be printed through MpixPro as well. Hop over to EW Couture Collection site to check out all the 2010 EWCC Collection Christmas and holiday card templates. Catching up - part four :: New Life. Renewed Love.